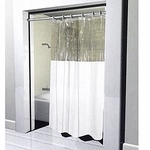 Buy wholesale shower curtains by the case at low prices with Fast & Free Shipping from Palmetto Linen Distributors. 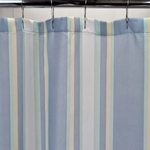 As a wholesale supplier to businesses that need shower curtains in bulk, we stock both Traditional Shower Curtains & EZ ON No-Hook Shower Curtains ready for immediate shipment. Either style is available in several sizes, colors, and materials that work great in hospitality and commercial business settings. Quickly becoming the most popular type for hospitality and commercial use, the No-Hook, Pre-Hooked or Hookless ® Shower Curtains have built-in flex rings for quick and easy hanging. The built-in hooks eliminate the need for you to buy additional shower hooks and also make installation fast and easy to save time and labor cost. 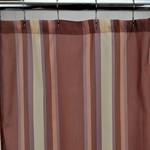 Traditional shower curtains with holes for shower hooks or rings are available in sizes to fit almost all showers and bathtubs. 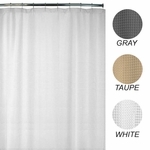 Choose from Standard size shower curtains to Extra Long and Stall size. The stall size shower curtains are available in either see through window style or window-less styles depending on your preference. 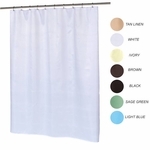 If you have any questions or if you need wholesale shower curtains made from a specific material, such as; Plastic, EVA, PEVA, Vinyl, or Fabric, please feel free to contact us. We are more than happy to help with your questions and to offer recommendations for your specific bathroom and business needs.